Managed Futures offer the opportunity to reduce the volatility risk of a traditional stock/bond portfolio. Modern Portfolio Theory was developed by the Nobel Prize winning economist Dr. Harry M. Markowitz. Dr. Markowitz stated that a portfolio’s efficiency can be increased by diversifying across asset classes that have low to negative correlations. The goal is to decrease the portfolio’s volatility risk. With the expansion of global futures exchanges, CTAs can now diversify their clients’ portfolios by geography as well as by market sector. Investors can participate in at least 150 worldwide futures markets trading a variety of products including financial instruments, stock indexes, precious metals, agricultural commodities, tropical products, currencies, and energy products. Trading advisors have many possible opportunities to profit from the broad array of non-correlated markets. Increased market volume and liquidity makes the markets more attractive as market efficiencies improve. CTAs offer investors benefits similar to those experienced with mutual funds and other investment advisors. 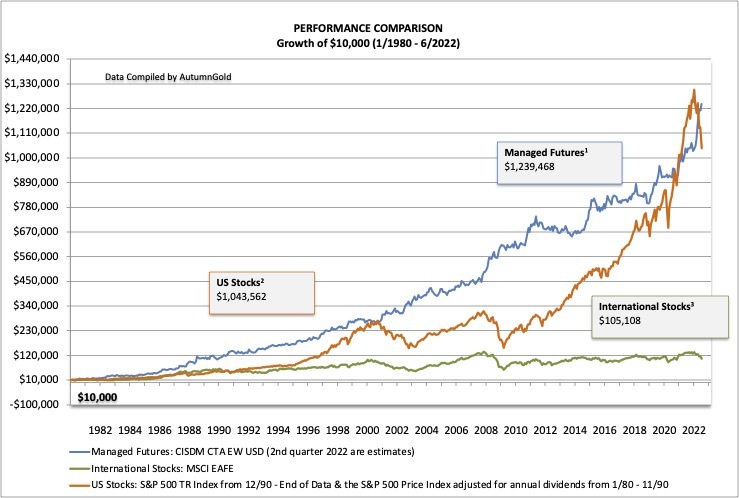 The addition of managed futures to a client’s portfolio does not mean that a portfolio will be profitable or that it will not experience substantial losses and that the studies conducted in the past may not be indicative of current time periods or of the performance of any individual CTA. The S&P 500 indices are designed to reflect all sectors of the U.S. equity markets. The S&P 500 includes 500 blue chip, large cap stocks, which together represent about 75% of the total U.S. equities market. Companies eligible for addition to the S&P 500 have market capitalization of at least US$3.5 billion. The TR Index accounts for the reinvestment of dividends. The MSCI EAFE Index (Europe, Australasia, Far East) is a free float-adjusted market capitalization index that is designed to measure the equity market performance of developed markets, excluding the US & Canada. The MSCI EAFE Index consists of the following 22 developed market country indices: Australia, Austria, Belgium, Denmark, Finland, France, Germany, Greece, Hong Kong, Ireland, Israel, Italy, Japan, the Netherlands, New Zealand, Norway, Portugal, Singapore, Spain, Sweden, Switzerland, and the United Kingdom. As of May 30, 2011. The CISDM Equal Weighted CTA Index is an equal weighted index of CTAs maintained by The Center for International Securities and Derivatives Markets at the University of Massachusetts Amherst. It reflects the average performance of Commodity Trading Advisors reporting to the CISDM Hedge Fund/CTA Database. Each CTA must have at least $500,000 under management and at least a 12-month track record.